Please see the previous article at http://ponnadi.blogspot.in/2014/09/virodhi-pariharangal-37.html. arthE vruththi:" (பிந்ந ப்ரவ்ருத்தி நிமித்தாநாம் சப்தாநாம் ஏகஸ்மின் அர்த்தே வ்ருத்தி:) - identifying the same substance with respect to multiple words (and attributes/meanings). For example, in the case of white cloth - both whiteness (being white) and clothness (being a cloth) are attributes of the cloth. So, multiple aspects pointing to a single substance is called sAmAnAdhikaraNyam. This is a very important principle to understand. This is one of the most important principles for our visishtAdhvaitha sidhdhAntham. brahmam is the visEshya (substance) and it is the AdhAra (support/base). chith (souls) and achith (matter) are visEshaNa (attributes) and AdhEya (supported). Substance and attributes are inseparable. Here some sidhdhAnthams ignore the chith and achith and simply focus on brahmam. But that is not valid. In vEdhArtha sangraham these principles are beautifully expounded in detail by emperumAnAr. These must be heard as kAlakshEpam under proper AchArya to get full understanding. Not knowing that such highlighting of the single brahmam (with attributes) is only to emphasis the unique nature of brahmam (and not to make souls and matter invalid/illusory) is an obstacle. EkavisEshaNa visishta aikyArththa param - About a singular substance attached to its attribute. sruthi says "sa brahmA, sasiva: sEndhra:" (ஸ ப்ரஹ்மா, ஸசிவ: ஸேந்த்ர:). sa - "He" indicating "that supreme purusha". He is brahmA, He is siva, He is indhra. Here this means, brahmA, siva, indhra are the sarIra/visEshaNa (body, attribute) and srIman nArAyaNa is the sarIrI/visEshya (soul/substance). Translator's note: There are usually 3 parts identified in vEdham - bhEdha sruthi (that which speaks about distinct entities), abhEdha sruthi (that which speaks about singular brahmam) and gataka sruthi (that which links brahmam and other entities (chith/achith). While other sidhdhAnthams may focus on bhEdha or abhEdha, visishtAdhvaitha sidhdhAntham harmonizes the bhEdha and abhEdha sruthis using gataka sruthi. Where there is emphasis on the singular brahmam, it is to be understood in context of gataka sruthi which highlights the sarIra/sarIrI relationship and visEshaNa/visEshya relationship between chith/achith and brahmam. In these two points, mainly mAyAvAdham (the principle of accepting brahmam only and declaring that everything else is illusory) is rejected. nammAzhwAr explains this in thiruvAimozhi 8.8.8 - "kUdiRRAgil nalluRaippu" (கூடிற்றாகில் நல்லுறைப்பு) pAsuram. In all the vyAkyAnams, similar principle is explained. There is no way jIvAthmA is the same as brahmam (and there is nothing else). Because one object cannot become another ever - jIvAthmA will be jIvAthmA and paramAthmA will be paramAthmA. Not knowing that the rejection of manifoldness is to establish that there is nothing that is independent of brahmam is an obstacle. nAnAthva nishEdham - Negation of manifoldness. "EkamEva adhvidhIyam, nEhanAnAsthi kinchana:" (ஏகமேவ அத்விதீயம், நேஹநாநாஸ்தி கிஞ்சந:) is present in sruthi. There is only one - no second entity. nAnA - many are not there. Here manifoldness is rejected. But this rejection is for entities that exist indpendent of brahmam. Since brahmam is the antharAthmA (in-dwelling soul) of everything, everything is pervaded by brahmam (sarvam brahmAthmakam). There is nothing that is not pervaded by brahmam. Not knowing that negation of chith and achith during samhAram (annihilation) is to indicate their subtle existence is an obstacle. samhAram is the third aspect of the general activities related to the universe(s). srushti (creation), sthithi (sustenance) and samhAram (annihilation) are the 3 aspects. During the samhAram, chith (souls) and achith (matter) do not get completely destroyed. They are eternal entities. They change from the gross state to a subtle state and are consumed by supreme brahmam. During srushti (creation), they again are given gross form by bhagavAn. Translator's note: This principle is nicely explained by thiruvarangaththu amudhanAr in rAmAnusa nURRanthAdhi 69th pAsuram. "chinthaiyinOdu karaNangaL yAvum chithainthu munnAL anthamuRRAzhnthathu" (சிந்தையினோடு கரணங்கள் யாவும் சிதைந்து முன்னாள் அந்தமுற்றாழ்ந்தது) - During samhAram manas (mind), senses and body - all assume the subtle state and become one with mUla prakruthi (primordial matter). During that state, chith (souls) that are naturally subtle and achith (matter) which have assumed subtle state, become indistinguishable. Still they exist. All three thathvams - chith (souls), achith (matter) and Iswara (God) are eternal. chith (souls) have svabhAva vikAram (change in attributes such as knowledge expanding and contracting). achith (matter) have svarUpa vikAram (change in its nature itself such as from gross to subtle and also assuming different gross forms). Iswara is devoid of any vikAram (change). Not knowing that negation of qualities in sOdhaka vAkyams are intended towards negation of inauspicious qualities is an obstacle. There are certain vAkyams (phrases) that explain brahmam as nirguNam (devoid of qualities). They are meant to say that brahmam is devoid of bad/inauspicious qualities. Since brahmam is already established as "akila hEya prathipata kalyANa guNaika thAna" (அகில ஹேய ப்ரதிபட கல்யாண குணைக தாந) - that which is devoid of all bad qualities and abode of all auspicious qualities only. Translator's note: brahmam is described in two types of vAkyams - kAraNa vAkyams (those phrases that talk about brahmam being the cause of everything) and sOdhaka vAkyams (those phrases that talk about the distinct qualities of brahmam). "yathO vA imANi bhUthANi jAyanthE, yENa jAthANi jIvaNthi, yathprayaNthi abhisamvichaNthi, thath vijijnYAsasva, thath brahmEthi" (யதோ வா இமாநி பூதாநி ஜாயன்தே, யேந ஜாதாநி ஜீவந்தி, யத்ப்ரயந்தி அபிஸம்விசந்தி, தத் விஜிஜ்ஞாஸஸ்வ, தத் ப்ரஹ்மேதி) is an example for kAraNa vAkyam. This explains that - That from which this whole universe and the beings are created, on which the whole universe is sustained, in which it merges during destruction, where the beings reach upon attaining mOksham, know that and know that to brahmam. Thus jagath kAraNathva (being the cause of the universe), mumukshu upAsyathva (being the object of the worship for the ones who desire to get mOksham) and mOksha pradhathva (having the ability to benedict mOksham to a jIvAthmA) are identified as the most important qualities of the supreme being. "sathyam gyAnam anantham brahma" is an example for sOdhaka vAkyam. This explains that brahmam is eternal, full of knowledge and boundless (by time, place and material). Thus sOdhaka vAkyams need to be understood properly. Turning a blind eye on vAkyams that exhibit the auspicious qualities of brahmam is an obstacle. As explained in "ya: sathyakAma: sathya sankalpa:" (ய: ஸத்யகாம: ஸத்ய ஸங்கல்ப:) - he is full of auspicious qualities. Ignoring those are obstacles. Translator's note: nammAzhwAr begins thiruvAimozhi with "uyarvaRa uyar nalam udaiyavan yavan" (உயர்வற உயர் நலம் உடையவன் யவன்) - One who is full of auspicious qualities. kUrathAzhwAn explains to his sishya piLLai piLLai AzhwAn that nammAzhwAr starts with proclaiming the auspicious qualities and thereby directly attacking the lifeline of kudhrushtis (ones who misinterpret vEdham) who constantly speak about brahmam being devoid of qualities. Not understanding that negation of form for brahmam indicates that brahmam does not acquire a form due to past karmA (instead brahmam acquires form due to the desire) is an obstacle. "nathE rUpam nachAkAra:" (நதே ரூபம் நசாகார:) - He has no form, no stature, etc., are focussed on material body which is acquired through ones karmA. One should understand that bhagavAn assumes variegated forms due to his desire. Turning a blind eye towards vAkyams that highlight bhagavAn with form is an obstacle. One should have full faith that paramapurusha (supreme lord) has most beautiful form. There is a well-known phrase in chAndhOgya upanishadh "antharAdhithyE hiraNmaya: purushOdhrusyathE - thasyayathA kapyAsam punNdarIkamEvamakshiNI" (அந்தராதித்யே ஹிரண்மய: புருஷோத்ருச்யதே - தஸ்யயதா கப்யாஸம் புண்டரீகமேவமக்ஷிணீ) - In the middle of the sun planet, a person who is shining like a radiant sun is seen. His two eyes resemble a lotus flower that is bloomed by the sun. Not knowing such matters is an obstacle. Translator's note: rig vEdham declares "sa u srEyAn bhavathi jAyamAna:" (ஸ உ ச்ரேயான் பவதி ஜாயமாந:) - bhagavAn becomes more praiseworthy when he appears in this world. In bhagavadh gIthA 4th chapter, kaNNan emperumAn reveals his avathAra rahasyam (the confidential details about his birth/appearance). In the 5th slOkam he explains to arjuna "both me and you have been born many many times. While you do not know about your previous births, I know all of mine". In the next slOkam he says "Though I am unborn, not liable to change/destruction and the lord of all, I take birth again and again out of my own sankalpa (desire)". In the next slOkam, he says "Whenever dharmam suffers and adharmam raises, I bring myself to appear during those times". In the next slOkam he declares "I appear in many different forms time after time to protect virtuous people, to annihilate miscreants and to establish dharmam". Finally in the 9th slOkam, he says to arjuna "One who meditates on my divine birth (forms) and my divine activities with the true understanding of them, he will be relieved from samsAram (cycle of birth and death) at the end of his present life and reach me". From these we can understand that brahmam has many divine forms which are not bound by karmA. Not knowing that brahmam that is identified as ubhaya linga visishtan (one who has two unique identities), vilakshaNa vigraha visishtan (one who has unique form), sriya: pathi (divine consort of srI mahAlakshmi), akAra vAchyan (one who is known by "a") is the most supreme lord (over everyone else) is an obstacle. akAra vAchyan - praNavam (Om) is the essence of all of vEdham. It is the combination of "a", "u" and "ma". 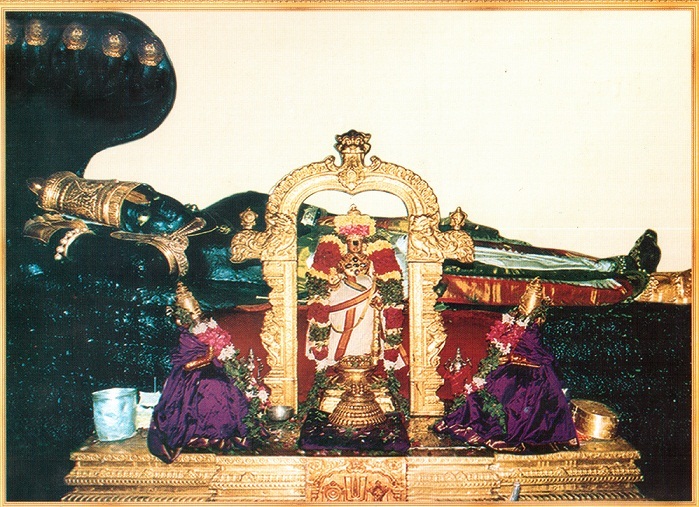 In this, akAram (a) represents srIman nArAyaNan who is the supreme lord. sarvasmAthparan - He is the one who has no one equal or higher to him. ubhaya linga visishtan - one who has 2 unique identities namely akila hEya prathyanIkan (one who is opposite to all inauspicious qualities) and kalyANa guNa pUrNan (one who is filled with auspicious qualities). He is most pure and also has the ability to purify others. He has both parathvam (supremacy) and saulabhyam (simplicity/easy approachability). akAram mainly emphasises on kAraNathvam (being the cause of everything) and rakshakathvam (being the protector for everyone). Not knowing that srIman nArAyaNan is the jagathkAraNan (cause of everything) is an obstacle. In chAndhOgya upanishadh it is explained that "sadhEva sOmya! idhamagra AsIth, EkamEva, adhvidhIyam". The same brahmam is explained in subhAla upanishadh as "EkOhavai nArAyaNa AsIth, nabrahmA, nEsAna:". From this, it is clear that nArAyaNan is the supreme cause. Translator's note: First, in the chAndhOgya upanishadh, udhdhAlakar explains to his child that - (before srushti) sath only existed, only that, nothing else. Here, the 3 different emphasis (sadhEva, EkamEva, adhivdhIyam) of negation of everything else other than brahmam is explained as the three different kAraNams (causes) namely upAdhAna kAraNam (material cause), nimiththa kAraNam (efficient cause), sahakArikA kAraNam (ancillary cause). For example, to make a pot, soil is the upAdhAna kAraNam, potter (and his desire to make the pot) is the nimiththa kAraNam and stick, wheel, etc are the sahakArikA kAraNam. For srushti, chith (souls) and achith (matter) are the upAdhAnam - these are sarIra (body) for brahmam. brahmam's sankalpam (desire/will) is the nimiththam. brahmam's gyAnam, sakthi, etc are the sahakArikA. The same principle is explained by nammAzhwAr in thiruvAimozhi 2.8.10 pAsuram as "vEr mudhalAy viththAy" (வேர் முதலாய் வித்தாய்) - vEr (root) is the sahakAri, mudhal (the urge to grow) is the nimiththam and viththu (seed) is the upAdhAnam. Here bhagavAn himself is identified as all 3 causes. This same brahmam is identified in subhAla upanishadh as nArAyaNa. There it explains that nArAyaNa only existed and there was no brahmA, siva, etc. From these, we can understand that nArAyaNa is the supreme cause of everything. Being confused with principles that highlight pradhAnam (matter), paramANu (atomic particle) as primordial causes is an obstacle. pradhAnam is prakruthi that is achith (matter). Soil cannot become a pot by itself. Matter by itself cannot be an independent and primordial cause. paramANu (atomic particle) being the cause is presented by kaNAdha. This can also be not accepted. sarvEsvaran srIman nArAyaNan who is the all-pervading antharyAmi of all universes is the only cause as seen in "vEr mudhalAy viththAy". There should be no doubt about this. Translator's note: piLLai lOkAchAryar, in thathva thrayam sUthrams 153 to 156 reject the concept of pradhAnam and paramANu being the cause. mAmunigaL has given beautiful explanation for these sUthrams. paramANu (atomic particle) being the cause is putforth by baudhdha, jaina and vaisEshikas. pradhAnam (prakruthi - achith - matter) being the cause is putforth by kapila. Since these principles are contrary to sruthi and are beyond logic they cannot be accepted. Considering brahmA, siva, etc (who are created by nArAyaNa) having parathva (supremacy), kAraNathva (being the cause of everything) is an obstacle. thirumazhisai AzhwAr explains in nAnmugan thiruvanthAdhi 1st pAsuram "nAnmuganai nArAyaNan padaiththAn, nAnmuganum thAnmugamAi sankaranaith thAn padaiththAn" (நான்முகனை நாராயணன் படைத்தான், நான்முகனும் தான்முகமாய்ச் சங்கரனைத் தான் படைத்தான்) - nArAyaNa created brahmA, brahmA in turn created sankara. As seen here, brahmA, rudhra, etc., dhEvathAs are created by srIman nArAyaNa. There is no question of supremacy or them being the cause. Considering brahmA, vishNu and rudhra as equals is an obstacle. brahmA, vishNu, rudhra are famously known as thrimUrthy (three deities). As explained by poigai AzhwAr in mudhal thiruvanthAdhi 15th pAsuram "mudhalAvAr mUvarE - ammUvaruLLum mudhalAvAn mUri nIr vaNNan" (முதலாவார் மூவரே - அம்மூவருள்ளும் முதலாவான் மூரி நீர் வண்ணன்) - Eliminating all other dhEvathAs, there are 3 primary dhEvathAs. Among those, the one whose body colour resembles blue colour of sea water, is the supreme/primary one. As explained in this pAsuram, among brahmA (who is responsible for creation), vishNu (who is responsible for sustenance) and siva (who is responsible for annihilation), vishNu is the primary deity. All 3 of them are not equal and not at the same level. Translator's note: nampiLLai highlights the reason for focussing on 3 of them in the vyAkyAnam for this pAsuram. He says that AzhwAr speaks about these 3 dhEvathAs (instead of focussing on the many many dhEvathAs) so that it is easy to reject just the two of them and highlight vishNu alone as supreme. piLLai lOkAchAryar explains different types of apachArams (offenses/mistakes) in srIvachana bhUshaNa dhivya sAsthram. While explaining bhagavath apachAram, in sUthram 303, he starts with considering dhEvathAntharams at par with bhagavAn srIman nArAyaNa as the first offense. nammAzhwAr also says in thiruvAimozhi 2.3.2 "oththAr mikkArai ilaiyAya mA mAyA" (ஒத்தார் மிக்காரை இலையாய மா மாயா) - The great lord who has none equal or higher to him. This follows svEthasthara upanishadh vAkyam "na thath samascha abhyadhikascha dhrusyathE" (ந தத் ஸமச்ச அப்யதிகச்ச த்ருச்யதே). Considering any one other than sarva rakshaka (protector/deliverer for the all - srIman nArAyaNa) as the rakshaka (protector/deliverer) is an obstacle. srIman nArAyaNa who is akAra vAchyan (meaning of "a") is the rakshaka for all. One who can bless all benedictions. dhEvathAntharams does not have this glory. Translator's note: piLLai lOkAchAryar has written a specific rahasya grantham named prapanna parithrANam. In this grantham he establishes that srIman nArAyaNa is the only protector and nothing/no one else can protect/deliver us. In mumukshuppadi 36th sUthram, piLLai lOkAchAryar explains the meaning of rakshakam. He explains that rakshakam means removing the obstacles and fulfilling the desires. In the subsequent sUthrams, he explains that obstacles and desires will vary depending on the type of jIvAthmA. For samsAri (materialist), enemies, disease, etc are obstacles and nice food, material pleasures, etc are the desires (goal). For mumukshu (one who desires for mOksham), the existence in samsAram is the obstacle and reaching paramapadham to perform eternal kainkaryam to bhagavAn is the desire. For mukthas (liberated) and nithyas (eternally free), any break in kainkaryam is obstacle and increase in kainkaryam is the desire. He then explains in sUthram 39 that "I have already explained 'There is no other deliverer than srIman nArAyaNa' in prapanna parithrANam". Thus whatever the obstacles, it is only bhagavAn who removes it and whatever the desires, it is only bhagavAn who benedicts that. Even when lesser intelligent persons approach dhEvathAntharams for benedictions, it is bhagavAn who is situated as the antharyAmi (in-dwelling soul) is the one who fulfills those desires through the particular dhEvathAntharam. Considering any one other than srIman nArAyaNa as the master is an obstacle. srIman nArAyaNa, who is the divine consort of srI mahAlakshmi is the only master of both paramapadham (nithya vibhUthi - eternal world) and samsAram (leelA vibhUthi - material world). sEshi means master, proprietor, owner. Considering any one else as Iswara (controller) is wrong. Translator's note: We have already seen this through thirumazhisai AzhwAr's words in nAnmugan thiruvanthAdhi pAsuram 53 "thiruvillAth thEvarai thEREnmin dhEvu" (திருவில்லாத் தேவரை தேறேன்மின் தேவு) - I will not treat such dhEvathas who lack connection with mahAlakshmi as dhEvathA ever. In mumukshuppadi, piLLai lOkAchAryar further explains in the section of bhagavAn's rakshakathvam (continuing previous point) that bhagavAn is always with srI mahAlakshmi while delivering/protecting others. Considering that there is something other than parabrahmam srIman nArAyaNa who is to be worshipped is an obstacle. mumukshu is the one who desires for mOksham (liberation - eternal kainkaryam in paramapadham). mOksham is benedicted by srIman nArAyaNan only. No one else can do that. Thus, such mumukshu should be fully confident that he/she must meditate only on srIman nArAyaNa. Translator's note: chAndhOgya upanishadh says "kAraNam thu dhyEya:" (காரணம் து த்யேய:) - supreme cause is to be meditated upon. It is important to understand that, this statement establishes the object of meditation - but it does not define who is supreme cause. We have already seen that the supreme cause is srIman nArAyaNa alone. By linking these two, the sidhdhAntham is established - i.e., one must meditate on the supreme cause and that supreme cause is srIman nArAyaNa. So, one must constantly meditate on srIman nArAyaNa. It is also important to note that srIman nArAyaNa is well known as "mukundha" which means one who benedicts liberation. Not knowing that other than purushOththaman (who is the benedictor of mOksha), there is no other person who can fulfill the desires of anyone is an obstacle. sarva abhimatha pala pradhan - one who can fulfill all types of expectations/desires. dhEvathAntharams can only give material benedictions. But kEsava who is parama purusha (supreme lord) can benedict all desires including mOksham. Worshipping kshudhra dhEvathAs is an obstacle. kshudhram - small/insignificant. Translator's note: dhEvathAntharams, as indicated previously, can only give material benedictions. But for a prapanna, the goal is to be freed from material desires and be situated in eternal kainkaryam to srIman nArAyaNa. In bhagavadh gIthA, 7th chapter, bhagavAn explains the limited nature of anya dhEvathAs (other dhEvathAs) and the benedictions given by them. He clearly rejects any worshipping of dhEvathAntharams as such worshipping lead to repeated birth/death in this samsAram only. Having desire for temporary/insignificant aspects is an obstacle. Translator's note: Similar to previous point. Being a prapanna, one should shed the interest towards temporary and insignificant aspects and focus on eternal kainkarayam to bhagavAn in paramapadham. Please see the previous article at http://ponnadi.blogspot.in/2014/09/virodhi-pariharangal-36.html. sidhdhAntham means established doctrine. In a particular subject matter, rejecting faulty understandings and establishing the proper understanding is called sidhdhAntham. Whatever doctrine that is presented by us, that must be in line with vEdham, proofs that are shown in sAsthrams and the explanations given by the learned scholars for the same. The proofs that are shown from sAsthram to establish our doctrine are called pramANams. vEdham is accepted as eternal and blemishless pramANam by all Asthikas (learned scholars who accept vEdham as the ultimate authority). vyAsa bhagavAn's divine words are "vEdhAth sAsthram param nAsthi na dhaivam kEsavAth param" (வேதாத் சாஸ்த்ரம் பரம் நாஸ்தி ந தைவம் கேசவாத் பரம் - There is no scripture higher than vEdham and there is no God higher than kEsava). param means supremacy which indicates "none/nothing equal or higher". As explained in the first thaniyan (invocatory verse) of nammAzhwAr's thiruvAimozhi "dhrAvida vEdha sAgaram" (த்ராவிட வேத ஸாகரம் - the ocean of dhrAvida vEdham - thiruvAimozhi), dhivya prabhandhams compiled by AzhwArs are also considered at par with vEdham. The main principle established by this doctrine is "nArAyaNa param bramha thathvam nArAyaNa: para: ... yachcha kinchith jagath yasmin dhrusyathE srUyathEpicha, anthar bahis cha thath sarvam vyApya nArAyaNas sthitha:" (நாராயண பரம் ப்ரம்ஹ தத்வம் நாராயண: பர: ... யச்ச கிஞ்சித் ஜகத் யஸ்மிந் த்ருச்யதே ச்ரூயதேபிச, அந்தர் பஹிஸ் ச தத் ஸர்வம் வ்யாப்ய நாராயணஸ் ஸ்தித: - nArAyaNa is the supreme brahmam, he is the supreme principle ... whatever is seen/heard of in this universe, he is manifesting both inside and outside of everything). This means he exists as the in-dwelling soul inside each object. He also holds them all by being the abode (outside) of everything. With this, let us enter this section now. Translator's note: Our sidhdhAntham is named as visishtAdhvaitha sidhdhAntham - purely a vaidhIka sidhdhAntham (doctrine based on vEdham, vEdhAntham, etc). This sidhdhAntham is eternal and ever-existing. Sages like parAsara, vyAsa, bhOdhAyana, tanka, dhramida, etc., first propagated the full meanings of this. Subsequently, AzhwArs appeared and propagated dhrAvida vEdham which also reflects the essence of vaidhIka principles. srI rAmAnuja wrote detailed commentaries for brahma sUthram and bhagavadh gIthA. He also explained the main principles of upanishadhs in his other works. srutha prakAsikAchArya was one of the main AchAryas who explained srI rAmAnuja's works in detail. AzhwArs pAsurams were explained in detail through many commentaries. nampiLLai was one of the main AchAryas who brought out some of the most intricate meanings of the divine pAsurams of AzhwArs. His disciples periyavAchAn piLLai and vadakku thiruvIdhi piLLai fully assisted him in his efforts to bring out the divine meanings of nammAzhwAr's thiruvAimozhi. piLLai lOkAchAryar and azhagiya maNavALa perumAL nAyanAr beautifully brought out the essence of thiruvAimozhi and documented them in many wonderful rahasya granthams (confidential literature). maNavALa mAmunigaL wrote wonderful commentaries for these rahasya granthams and also delivered wonderful discourses linking dhivya prabhandham, vEdhAntham and rahasya granthams. Thus, this sidhdhAntham was nurtured by many great scholars over several generations in history. The main principle in this sidhdhAntham is, there are 3 entities - chith (innumerable jIvAthmAs), achith (unlimited matter) and Iswara (the supreme lord). Here, Iswara (the single independent supreme lord) and chith (sentients)/achith (insentients) - have two important relationships. First is sarIra/sarIri bhAvam - i.e., bhagavAn is the in-dwelling soul (sarIri - that which has sarIram/body) of all chith and achith and they (chith and achith) in turn are bodies for bhagavAn. Second is visEshaNa/visEshya bhAvam - i.e., bhagavAn is the one (visEshya - object) who has chith and achith as his attributes (visEshaNa). So, put together, bhagavAn with chith/achith is said to be a distinctive entity which has no second entity similar to him. Also, srIman nArAyaNa is established as the supreme lord through various pramANams from sAsthram. In this section, there are many in-depth principles are revealed. Lot of these need prior knowledge of some of the basic principles of vEdham, vEdhAntham, etc. This is a very lengthy section too. Let us now go into the section and learn more on this subject. Accepting pramANams that are contrary to vaidhIka sidhdhAntham (doctrines of vEdham/vEdhAntham) is an obstacle. Principles that are explained in a contrary manner to the established doctrine of vEdham, whoever may explain it, such contrary principles should not be accepted. Translator's note: There is an important point to understand in this aspect. One must understand that that there is sAsthram and sAsthra thAthparyam (essence). Learned scholars like our pUrvAchAryas would eloquently explain the principles with pristine understanding on both sAsthram and sAsthra thAthparyam. For example, varNAsrama dharmam (division of the society based on class and order) is greatly emphasised in sAsthram. But there is also bhagavath kainkaryam (confidential service to bhagavAn) and bhAgavatha dharmam (dealings with bhAgavathas) which are explained in sAsthram. Here our pUrvAchAryas have understood the essence of sAsthram and explained both varNAsrama dharmam and bhagavath kainkaryam/bhAgavatha dharmam with fine balance. They have highlighted the importance of both and yet established that bhagavath/bhAgavatha kainkaryam takes higher precedence over plain varNAsrama dharmam (without proper understanding of the purpose of the same). This is a very good example to understand the brilliance of our pUrvAchAryas clearly establishing the doctrine. Not understanding that whatever explained in vEdham is self-evident even if it is contrary to prathyaksham, etc., is an obstacle. pramANa generally means proof. Our pUrvAchAryas have explained 3 pramANams - prathyaksham (direct perception through senses - vision, touch, sound, smell and taste), anumAnam (inference based on prior knowledge - for example, when we see smoke we understand that there is fire - this is based on previously seeing fire and smoke together), sabdham (vEdham along with its ancillary literature which explain the principles of vEdham in detail). Among these, vEdham is explained to be svatha: pramANam (ஸ்வத: ப்ரமாணம்) - self-evident (proof in itself) - without any question, the principles are accepted as it is. It is explained as "unquestionable authority". Just like accepting the existence of God, Asthika means one who fully accepts the authority of vEdham. Translator's note: vEdham/sAsthram is mainly for jIvAthmAs. Amongst the three entities explained before, bhagavAn is already sarvgaya (omnicient - one who knows everything) and so does not need vEdham. achith (matter) lacks knowledge and so vEdham is of not any use to matter. But for jIvAthmAs, vEdham is the guidelines to conduct their life and to progress spiritually upwards, ultimately to salvation (eternal kainkaryam to bhagavAn). vEdham/sAsthram is explained to be having 1000 times more care/attention on jIvAthmAs than a mother would have on her child. Whatever is explained in vEdham is purely for the well-being of the jIvAthmAs to help them progress spiritually. So, even if there are certain things which may seem contrary to our direct perception, we must accept vEdham and fully abide by that. For example, sAsthram says one is to fully focus on bhagavAn on EkAdhasi (11th day from full moon and no moon days) and avoid food, materialistic pursuits, etc., on such days. One may wonder why should sAsthram trouble me by restricting me from eating (by perception, fasting is difficult for many to follow) - but here, if we understand that sAsthram is helping us to evolve us to a higher spiritual platform, we will fully accept the principle explained in sAsthram and attempt to follow the same. Not having full faith in smruthi, ithihAsams, purANams, etc., which elaborately explain the meanings of vEdham and vEdhAntham is an obstacle. vEdha upa bruhmaNam - these are the ancillary literature that help us understand the principles of vEdham. These include smruthi, ithihAsams, purANams, etc. smruthi is the collection of literature that were written keeping the principles of vEdham in mind. ithihAsams - epics - historical documents - srI rAmAyaNam and mahAbhAratham. purANams include srI vishNu purANam, etc. One should have strong conviction that all of these are strong pramANams (proofs). bhagavAn himself says "sruthis smruthir mamaivAgyA, AgyAchchEthI mama dhrOhi, madh bhakthOpi na vaishNava:" (ஸ்ருதிஸ் ஸ்ம்ருதிர் மமைவாஜ்ஞா, ஆஜ்ஞாச்சேதீ மம த்ரோஹி, மத் பக்தோபி ந வைஷ்ணவ: - sruthi and smruthi are my orders, one who defies them are traitors. Even if he is my devotee, he would not be considered as a vaishNava). sruthi (vEdham), smruthi, ithihAsams, purANams, etc are all collectively called as sAsthram. kaNNan emperumAn also declares in bhagavadh gIthA 16.24 "thasmAth sAsthram pramANam thE" (தஸ்மாத் சாஸ்த்ரம் ப்ரமாணம் தே - therefore sAsthram is to be fully understood/accepted as pramANam). Translator's note: piLLai lOkAchAryar begins srIvachana bhUshaNa dhivya sAsthram as "vEdhArththam aRudhiyiduvadhu smruthi ithihAsa purANangaLAlE" (வேதார்த்தம் அறுதியிடுவது ஸ்ம்ருதி இதிஹாஸ புராணங்களாலே - the meaning of vEdham is explained firmly by smruthi, ithihAsams and purANams). mAmunigaL gives a classic explanation to start with. He says pramAthA (AchArya - preceptors) needs to establish the pramEyam (goal) through pramANam (proof - scriptures). He goes on to beautifully establish how vEdham is the ultimate pramANam. So, one first needs to know what is the ultimate pramANam and try to understand that through the ancillary literature by hearing from proper preceptors. Subsequently, mAmunigaL explains further the many different ancillary literature that are listed here and explain how they are valuable to help us understand the meanings of vEdham properly. This must be properly studied and understood and will give us a great understanding of this fundamental principle. Not knowing that among the various ancillary literature, those portions that speak about sAthvika (goodness) aspects that are absorbed/accepted by sAthvikas (people in the mode of goodness/righteousness) are the main pramANams (proofs/evidences) is an obstacle. Amongst the upabrumhmaNam (ancillary literature), especially purANams, those aspects that are in sAthvika mode are prime pramANams. There are sections with rAjasa (passion) and thAmasa (ignorance) aspects. Those are to be ignored. Translator's note: In mathsya purANam, it is stated that "yasmin kalpEthu yath prOktham purANam brahmaNA purA, thasya thasyathu mAhAthmiyam thath svarUpENa varNyathE" (யஸ்மின் கல்பேது யத் ப்ரோக்தம் புராணம் ப்ரஹ்மணா புரா, தஸ்ய தஸ்யது மாஹாத்மியம் தத் ஸ்வரூபேண வர்ண்யதே) - purANams were revealed by brahmA, in glorification of dhEvathAs who are of sAthvika (goodness), rAjasa (passion) or thAmasa (ignorance) nature, whenever (whichever time period) whichever quality (sathva/goodness, rajas/passion, thamas/ignorance) is predominant in brahmA. This slOkam is highlighted by mAmunigaL in the vyAkyAnam of 3rd sUthram of piLLai lOkAchArya's srIvachana bhUshaNa dhivya sAsthram. From this we can understand that purANams need to be understood in context of the particular section and our pUrvAchAryas (who are pure sAthvikas) gave more importance to the sAthvika portions of the purANams. sAthvika portions of purANams speak fully about srIman nArAyaNa and his glories. This is the prime focus of vaishNavas. Not knowing that sAthvika aspects relating to rAjasa/thAmasa personalities are anupadhEyam (not acceptable) for sAthvikas is an obstacle. In the purANams that are focussed on brahmA, siva, lingam, etc., who are rAjasa/thAmasa personalities, the sAthvika portions are to be accepted. Here in the source text it is said as anupAdhEyam (not acceptable) - but it is likely a typo and should be upAdhEyam (acceptable). In thiruvAimozhi 6.10.8 nammAzhwAr glorifies sAthvika quality of siva as in "nuNNuNarvin nIlAr kaNdaththammAnum" (நுண்ணுணர்வின் நீலார் கண்டத்தம்மானும் - siva who is most knowledgable and who helped the entire universe by swallowing the poison and thus having bluish neck). Here AzhwAr glorifies siva since he came to worship thiruvEnkatamudaiyAn when his sathva guNam (quality) was predominant. Also, the famous pramANa slOkam "vaikuNtEthu parE lokE ... AsthE vishNurachinthyAthmA" is seen in linga purANam - this slOkam is recited during thiruvArAdhanam during manthra pushpam everyday by srIvaishNavas. Not having full conviction in aruLi cheyal (dhivya prabhandham) that it is blemishless as it is without any division of sAthvika, rAjasa, thAmasa, etc., since it is fully sAthvika and was fully accepted by the most saintly pUrvAchAryas is an obstacle. dhivya prabhandhams of AzhwArs who were divinely blessed by srIman nArAyaNa with pure knowledge and devotion towards him are the purest. Since these were accepted and pursued by the most saintly pUrvAchAryas, there is no scope for finding any fault in them. Strong conviction in this principle is very necessary for srIvaishNavas. Not being fully confident that the divine words of pUrvAchAryas are the most authentic for sAthvika persons is an obstacle. Just like AzhwArs were blessed by srIman nArAyaNa, pUrvAchAryas were blessed by AzhwArs. Their instructions are to be accepted fully and glorified. Translator's note: In dharma sAsthram, it is said that "dharmagya samayam pramANam vEdhAs cha" - The thoughts/views of great personalities are authority, vEdham is an authority too. Here dharmagya means to "One who knows dharmam" - for us sidhdha dharmam (established righteous principle) is bhagavAn and thus dharmagya refers to AzhwArs and AchAryas who were fully aware about bhagavAn's nature, names, forms, qualities, etc. So, we need to have total faith in the words of our pUrvAchAryas. maNavALa mAmunigaL explains this aspect in upadhEsa raththina mAlai 36 "theruLuRRa AzhwArgaL chIrmai aRivArAr, aruLich cheyalai aRivArAr, aruL peRRa nAdhamuni mudhalAna nam dhEsikarai allAl pEdhai manamE! uNdO pEchu" (தெருளுற்ற ஆழ்வார்கள் சீர்மை அறிவாரார், அருளிச் செயலை அறிவாரார், அருள் பெற்ற நாதமுனி முதலான நம் தேசிகரை அல்லால் பேதை மனமே! உண்டோ பேசு) - Who knows the true glories of the fully knowledgable AzhwArs? Who knows the divine meanings of dhivya prabandhams? Oh dear heart! Tll me if there is any one like our pUrvAchAryas starting with nAthamunigaL who were divinely blessed by AzhwAr(s)? There are so many incidents of our pUrvAchAryas that are recorded in many granthams. We need to constantly study, hear, contemplate on those and attempt to follow them with sincere devotion for the well-being of ourselves. Not having full faith in srI pAncharAthram which was spoken by srIman nArAyaNa himself directly is an obstacle. One should not have even an iota of doubt on the authenticity of srI pAncharAthra samhithAs which was directly revealed by srIman nArAyaNa and is famously known as "bhagavath sAsthram". It should be treated as good as vEdham itself. parmAchArya ALavandhAr blessed us with a divine grantham named "Agama prAmAnyam" (Agama - srI pAncharAthra Agamam) which establishes the authenticity of srI pAncharAthra Agamam in detail. Not having full faith in the fact that all pramANams are focussed on bhagavAn's svarUpam (true nature), names, forms, qualities, wealth, etc., is an obstacle. In bhagavadh gIthA 15.15, kaNNan emperumAn declares "vEdhais cha sarvair ahamEva vEdhya:" (வேதைஸ் ச ஸர்வைர் அஹமேவ வேத்ய:) - the whole of vEdham (sAsthram) is revealing about me only. The objective of the whole vEdham is to glorify bhagavAn only. periyAzhwAr says in periyAzhwAr thirumozhi 2.9.6 "vEdhapporuLE en vEnkatavA" (வேதப்பொருளே என் வேங்கடவா - Oh vEnkatava who is the object/meaning of vEdham). Here bhagavAn includes his true nature, forms, qualities, wealth, etc. Translator's note: For the gIthA slOkam 15.15, emperumAnAr explains in his bhAshyam (commentary) that just like when manu smrithi 12.9 says "sarIrajai: karma dhOshai: yAthi stAvarathAm nara:, vAchikai: pakshi mrugathAm mAnasair anthyajAthithAm" (சரீரஜை: கர்ம தோஷை: யாதி ஸ்தாவரதாம் நர:, வாசிகை: பக்ஷி ம்ருகதாம் மாநஸைர் அந்த்யஜாதிதாம்) - When a man hurts others physically through his hands, he becomes a tree; when he hurts others through words, he becomes birds/animals and when he hurts others through mind, he becomes a man of very low birth. Here though the different types of body (human, plant, animal, tree, etc) is explained, ultimately it is talking about the jIvAthmA's current action and resulting next birth. Similarly, whenever vEdham talks about any dhEvathA like agni, vAyu, etc., ultimately it is only talking about srIman nArAyaNa who is the in-dwelling soul of all entities. For the periyAzhwAr thirumozhi pAsura vyAkyAnam, mAmunigaL quotes this same gIthA slOkam and as hinted in the pAsuram itself, he beautifully explains "that object of vEdham is visibly present as thiruvEnkatamudaiyAn in front of me". Not having the understanding that all words ultimately mean (point to) paramAthmA who is always together with achith and chith is an obstacle. brahmA hails srI rAma in srI rAmAyaNam as "bhavAn nArAyaNO dhEva: jagath sarvam sarIram thE" (பவாந் நாராயணோ தேவ: ஜகத் ஸர்வம் சரீரம் தே) - You are nArAyaNa, the supreme God. All of this universe is your body. Whatever that is seen, heard about, etc., they are all body of para brahmam srIman nArAyaNa. He is manifested in jIvAthmAs directly and is manifested in matter through jIvAthmA. Any thing which has name and form, such thing is pervaded by bhagavAn from within. Translator's note: In vEdhArtha sangraham, srI rAmAnuja explains that one who is learned in vEdhAntham will see bhagavAn in everything. For example, when such person sees a goat, they will see the jIvAthmA inside the goat and the paramAthmA inside the jIvAthmA. But one who is not learned in vEdhAntham, they will simply see the goat, since he/she is not familiar with the concept of thathva thrayam - chith, achith and Iswara. Not knowing that bhagavAn is the in-dwelling soul of everyone/everything is an obstacle. Similar to previous point. Translator's note: In nArAyaNa sUktham its explained that "anthar bhahis cha thath sarvam vyApya nArAyaNa sthitha:" (அந்தர் பஹிஸ் ச தத் ஸர்வம் வ்யாப்ய நாராயணஸ் ஸ்தித:) - everything is pervaded inside and outside by srIman nArAyaNa. Same principle is explained by nammAzhwAr in thiruvAimozhi 1.1.10 "parandha thaN paravaiyuL nIr thoRum parandhuLan parandha aNdam idhena nila visumbu ozhivaRa karandha sil idam thoRum idam thigazh poruL thoRum karandhengum parandhuLan ivai uNda karanE" (பரந்த தண் பரவையுள் நீர் தொறும் பரந்துளன் பரந்த அண்டம் இதென நில விசும்பு ஒழிவற கரந்த சில் இடம் தொறும் இடம் திகழ் பொருள் தொறும் கரந்தெங்கும் பரந்துளன் இவை உண்ட கரனே) - bhagavAn exists in small drops of cool water of the ocean as comfortably as living in a huge universe all by himself. Similarly, he lives in this earthly planet, higher planets, etc., and even in the minutest of places and the jIvAthmAs that are present in such places. He is present there even though such jIvAthmAs may not realize his presence. Such all pervading lord consumes them all during samhAram (devolution) as well and protects them by keeping them inside him.